It's been four years now since we started managing and caring for the Riverfront Cats. In total there are now 19 cats. Most of them were born before we moved into these new condos, fed by construction workers during the building boom and then bust of 2007, 2008 in downtown Miami. The Riverfront Cats are at least four years old or older. Throughout these years the cats have appeared relatively healthy. Some of the cats are feral, semi-feral and friendly. So what happens when a feral cat gets sick? How do we capture them? Is our vet trained to exam a feral cat? Does it make sense to spend hundreds of dollars on a sick feral cat? We knew the day would come when we would have to ask these weighted questions and make difficult life and death decisions. That day was last week. Some of you may remember Lion King. He was one of the three cats that Christine first trapped when learning about TNR in 2009. This semi-feral cat was losing weight during the winter when most of the outdoor cats gain weight. Red Flag #1. Then Christine noticed drooling. Red Flag #2. You see semi-feral cats do not normally drool. Christine knew this was most likely stomatitis or a form of dental disease. She had treated a sick cat in South Beach with the same symptoms. She knew to observe Lion King while he was eating. Sure enough, in just letting the moist food touch his mouth, Lion King flinched and the gob of moist food fell out of his mouth and missed the ceramic bowl (yes our neighborhood cats get treated like true pets in sanitary, clean bowls). This happened repeatedly for weeks. It was so painful that Lion King could not eat. He was literally starving to death and his body was shrinking and shriveling. He was a dull blonde sack of skin and bones. We knew it was time to make plans to capture and treat him. More questions swirled. Would Lion King stop trusting the volunteer who captured him and took him to unknown environment with a room full of strangers, the vet clinic? If regular pets dreaded the vet clinic would this fear be exponential for a feral cat? Would Lion King stop trusting all the volunteers? Would he even appear at feeding time? What if he needed daily medicine administered in his food? In the meantime, he was deteriorating. It was time to stop wondering and stop the pain. The task began of capturing Lion King. Both Sabrina and Christine, on separate occasions, attempted to carefully place him in the carrier (he only allows us to touch him at feeding station, hence why he's "semi-feral") but Lion King scuffled and ran off only to return seconds later for more petting. That alone was unexpected and a joyous moment. He was semi-feral, but he loved and trusted us. After six attempts of grab-push-scuffle, we abandoned the gentle approach. You know the saying "it takes a village". Thankfully our friends at neighboring Florida Power & Light yard would keep an eye on Chaz Leroy and Lion King. (The piles of lumber and concrete blocks are a playground for the cats). They too noticed Lion King's deterioration. True cat men and animal lovers, Chistine received the call last Wednesday that Richard caught Lion King. Finally! She then rushed him to the vet. Lion King would have to be sedated in order to examine him. Did the vet know how to handle a feral cat to sedate him? We always wondered if all vets were trained in handling feral cats. "Yes we do this all the time with unfriendly cats". But they sent Christine home to wait. Before heading out the door, there was the matter of the the estimate $370-$580. Ouch. First, the examination. The good news. No tumors were visible. The drooling was blood and puss from an infected tooth and gums. A tooth extraction was the answer. Next a blood test. The vet called to announce that Lion King tested positive for FIV, feline Aids, transmissible to other cats. The first decision "Do you want to consider euthanization since he could infect other cats"? It was a loaded question that we never anticipated. What was the correct answer? There is no right or wrong answer. Only the caretaker can assess all the variables and reach one decision. The ultimate goal is that the cat not suffer. Sometimes euthanasia is the only humane solution. The volunteers conferred. 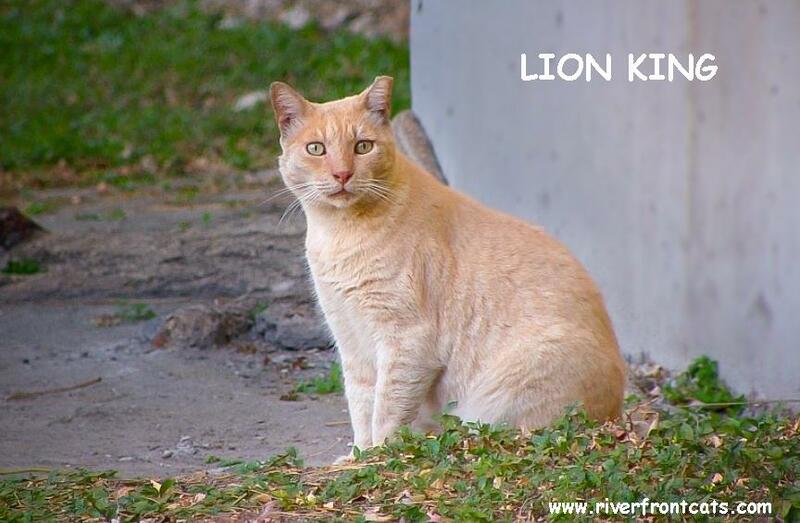 Lion King roamed the west side of the building and was in contact with three other cats. We knew they didn't fight. Chaz Leroy was also his best buddy. They loved each other. Secondly, if Lion King didn't have cancer or if an injection now could replace daily doses of medicine, and if volunteers could collectively pay the bill until fundraising efforts were launched, the decision was easy--continue with the treatment. No euthanasia. Per the vets instructions, Lion King recuperated indoors overnight (inside the carrier) and was released outdoors (his home) the following day. His dilated sleepy eyes perked up when he heard familiar noises of the outdoors--the sweaky gears of the door from the parking garage, the rustling of dried leaves from winter dryness... We opened the carrier door and crouching, he slunk way. Would he return at sunset for dinner? Would he ever allow us, the once trusted caretakers, to feed him let alone pet him? We would wait an eternal six hours until sunset. This experience has provided deeper insight about the behavior of feral cats. No two cats are alike and even semi-feral cats have distinct personalities, habits and gestures and will trust caretakers. More importantly, this story demonstrates that caring for a colony is the same as caring for outdoor pets. Feeders of feral cats need to consider the responsibility of taking sick cats to the vet and the associated costs. This is why we encourage feeders to learn the proper way to trap cats and to educate neighbors and residents about the plight of homeless cats to seek support and teamwork so one person does not carry the burden. That's how Riverfront Cats started. Christine jumped into action, learned about TNR and TNRM and immediately created flyers to pass out to neighbors. She also hands out flyers with updates. So if you are wondering what was the total bill well...Lion King also received dental cleaning and tartar removal to prevent further infection. The vet did recommend to bring him once a year for dental cleaning given that his immune system is weakened and can not fight infections. To treat his dehydration and lack of nutrients, he was given electrolytes and fluids through an IV. All this along with anesthesia, an injection of antibiotics, totaled $575.80. With our nonprofit discount, it was reduced to $480 (click here to view the full bill). If you follow a charity, you probably receive a regular stream of letters and emails asking for financial donations presented with poignant stories like Lion King. We know you care and want to help but like most people, there are budgets and limits. We have a better idea! CLICK HERE. Donation are always welcome. Simply click on the DONATE NOW button to the right. Is Your Cat afraid of the Big Bad Vacuum Cleaner? Are all cats afraid of The MONSTER??? The Vacuum Cleaner? Turns out many pet households also label this loud, moving appliance as the unfriendly alien. In general cats are frightened by sudden or loud noises. Even dogs can be spooked by these upright, mobile, metal/plastic objects with roaring noise. Our family of felines exhibit a range of reactions in response to the bright yellow "transformers". Hansel & Gretel immediately scamper and run under the bed. Helio will watch at a distance but once the machine comes within a few feet, he races off true to his name sake (race car driver Helio Castronoves). Jean Pierre and Geisha will awaken from a nap and give a perturbed look "Do you have to vacuum now mom? It's nap time". As the monster comes within inches, the "man of the house" and "supermodel" jump out of their pet beds and seek refuge in the next room. I apologize for interrupting their beauty sleep. We also know there are exceptions. Meet Johnny Walker who is more curious than scared of the vacuum cleaner. He is one cool cat! See the video below. And he's an all black cat--just further proof that black cats are intelligent and special! Stress is unhealthy for humans and cats. It's important to announce to your cat of the incoming intrusion. At our household, the sound of the wheels of the vacuum cleaner signals that the Monster will rear it's roaring self. We'd like to know if your cat is scared and how they react. Tell us! Also what do you call the vacuum cleaners? Do you call it "The Monster" or some other label? Leave a comment below and take our poll to the right.